Over the weekend Alex and I headed up for a day in Austria. The weather wasn’t perfect, but the clouds actually made the looming mountains seem all the more impressive. 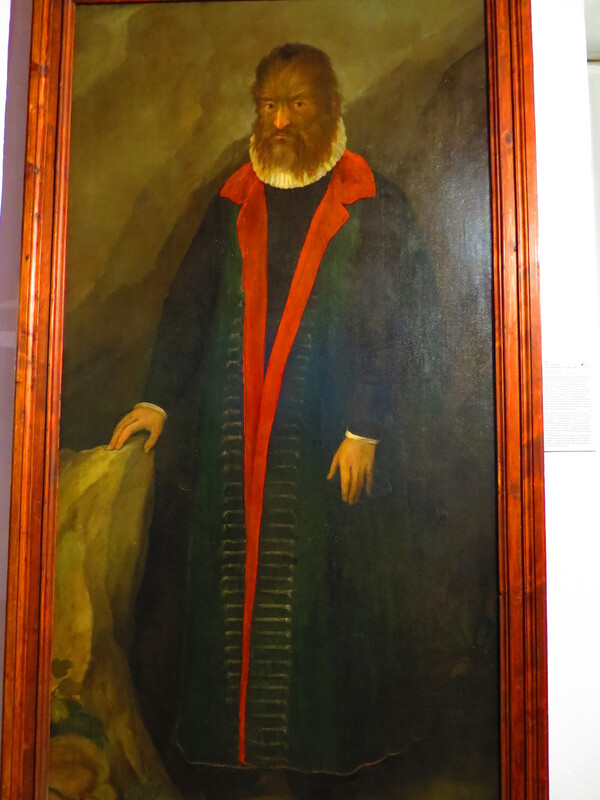 Innsbruck is about a four hour drive north of Vicenza, and we started off with a stop at Ambras Castle in the hills just south of the city. 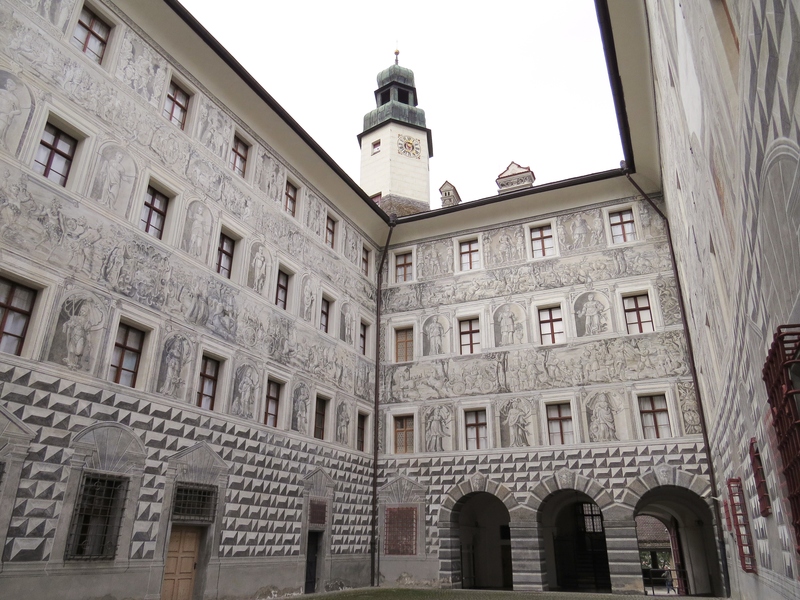 Ambras Castle was built in the 16th century by Archduke Ferdinand II. 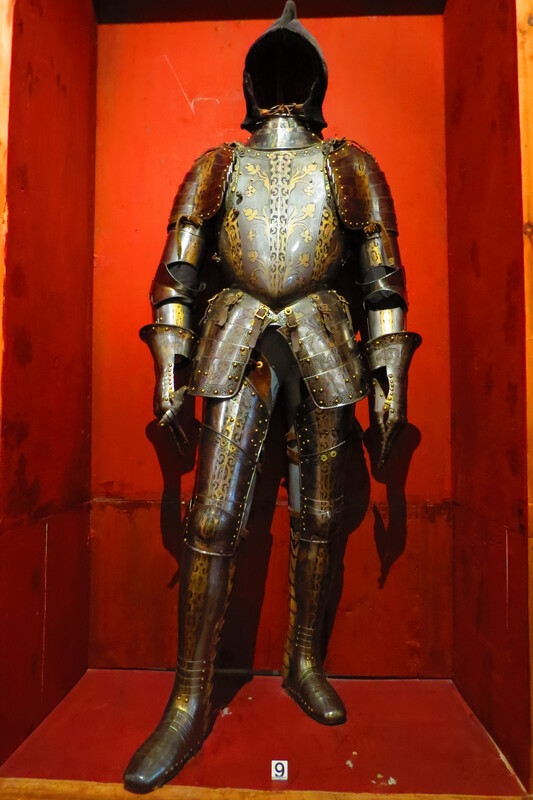 It became his palace and collection gallery – he had an extensive collection of… well, everything. 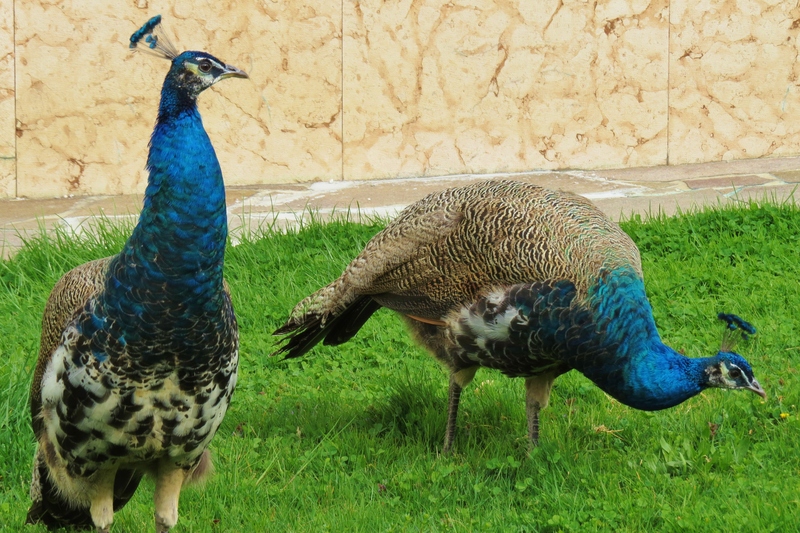 Including peacocks, apparently. The castle is divided into two sections – the upper and lower castles. The lower castle houses the galleries, including the Chamber of Art and Curiosities. Here you’ll find a whole room of busts (booooring), some more weaponry, and some of the weirdest pieces of art you’ll ever see. 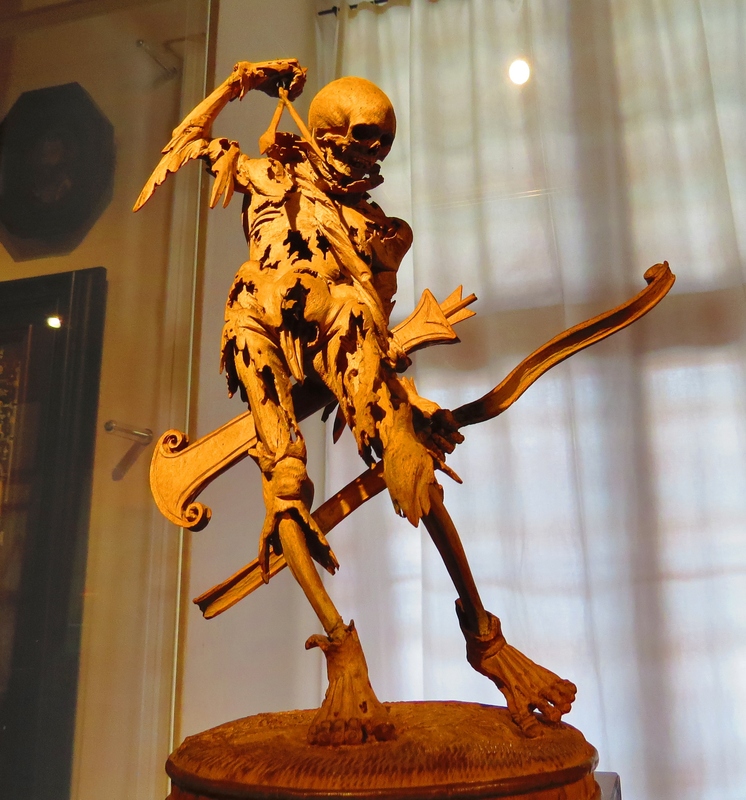 There were stuffed crocodiles and sharks hanging from the ceiling, little scenes made of coral, this scary-but-cool figure of death, and portraits of people with various disfigurements. (And one of Vlad the Impaler. I guess he was just morally disfigured.) One man featured a stake thrust through his eye and coming out the back of his head. He didn’t seem too bothered by it, somehow. 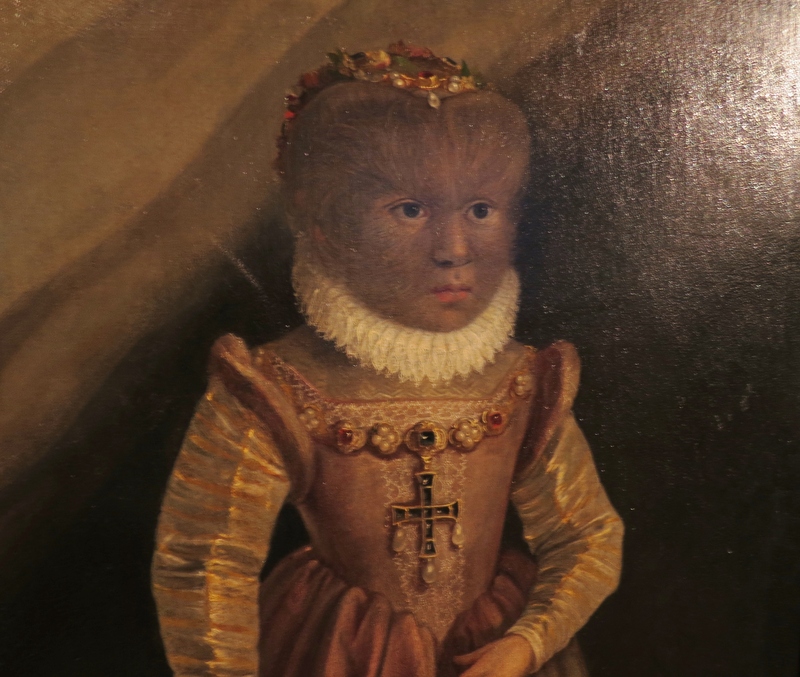 But my favorite was probably the hairy man and his hairy children. Maybe not-so-distant relatives of Sasquatch? 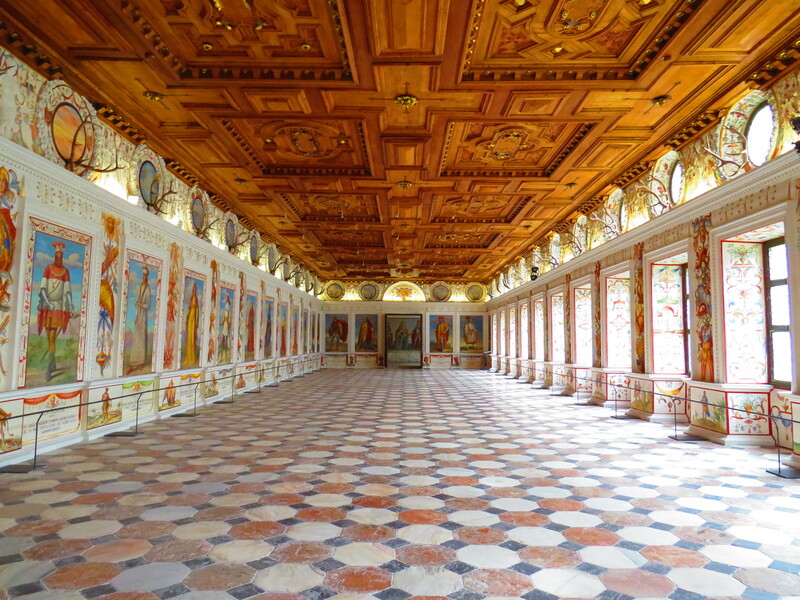 The upper castle includes the Spanish Hall, which is a gorgeous room painted from corner to corner with colorful designs and portraits of the Hapsburgs, one of the most important royal families of Europe. 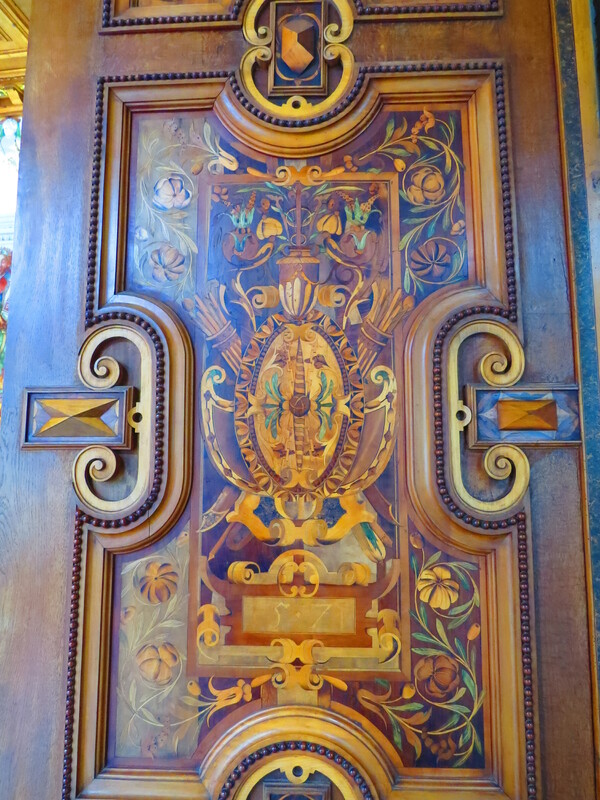 The ceiling and doors have gorgeous wood inlays that are, in my opinion, even more beautiful than the paintings. 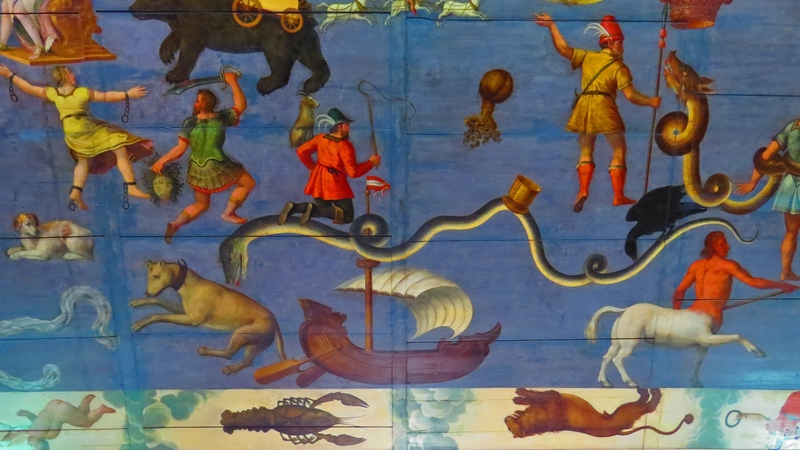 The rest of the upper castle seemed to have more paintings and some statues, and this really weird painted courtyard. 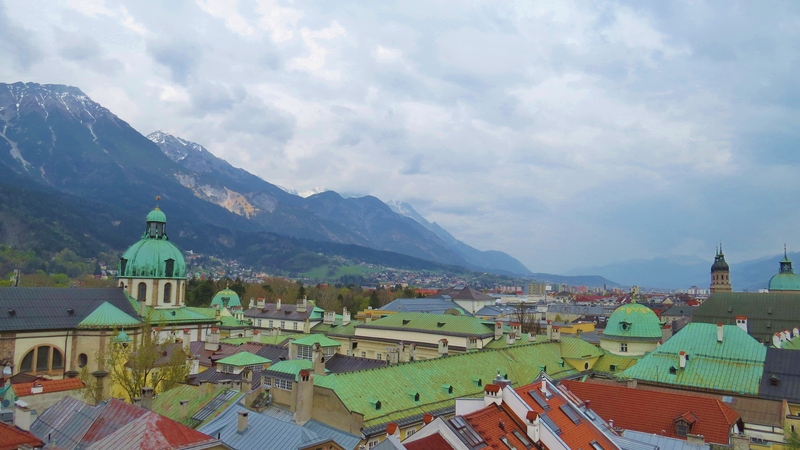 But what might have been the best part of Ambras Castle was this amazing view of Innsbruck. The castle has more extensive grounds and gardens than we got to see – I wish we had taken less time in the upper castle and wandered down to see them instead. We spotted some massive geese who didn’t seem to appreciate having their picture taken by tourists. So if you find them, don’t get too close unless you have some good running shoes on. 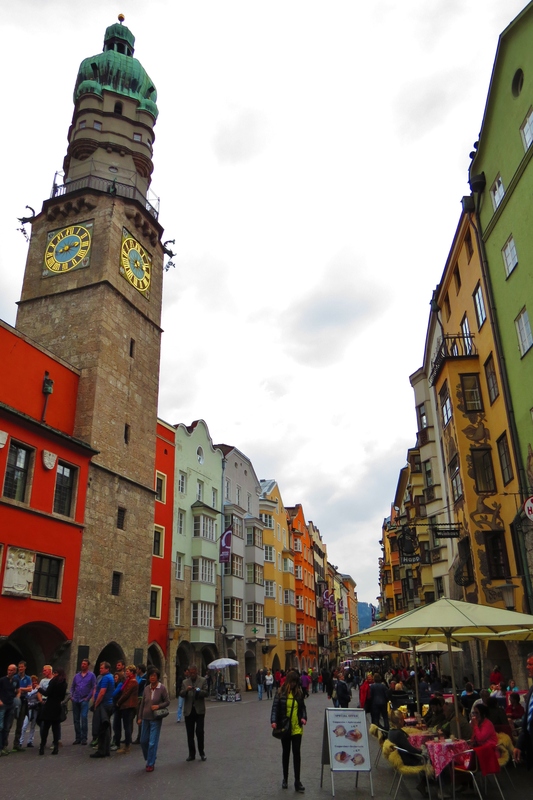 After Ambras Castle we finally headed downtown to see the real Innsbruck. I wish we’d had more time because there was certainly more to see, but we thoroughly enjoyed our four hours there. 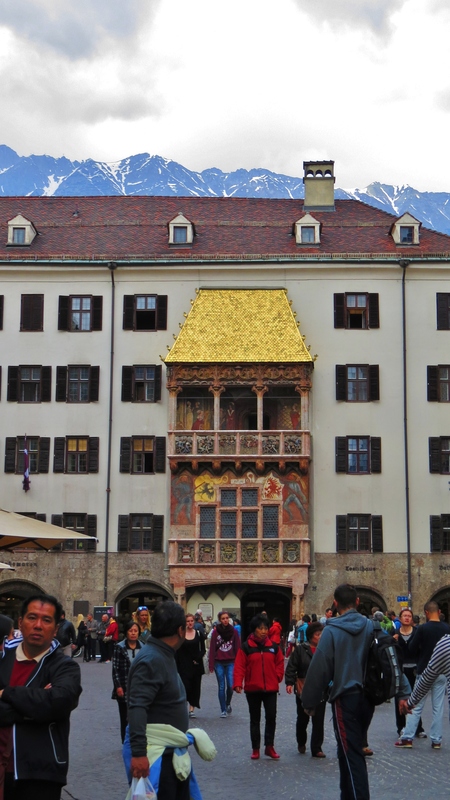 A good point of reference for the center of the Old Town is the Goldenes Dachl (Golden Roof). This roof was built by an emperor in 1500 for his wife on their wedding day. It’s a small roof over a balcony, where they used to sit and observe festivals and other events in the square. The tiles are actually gold plated copper, and they get a spruce-up every year with taxpayer money. I had never heard of the Golden Roof before, but apparently it’s one of the most important features of the city. 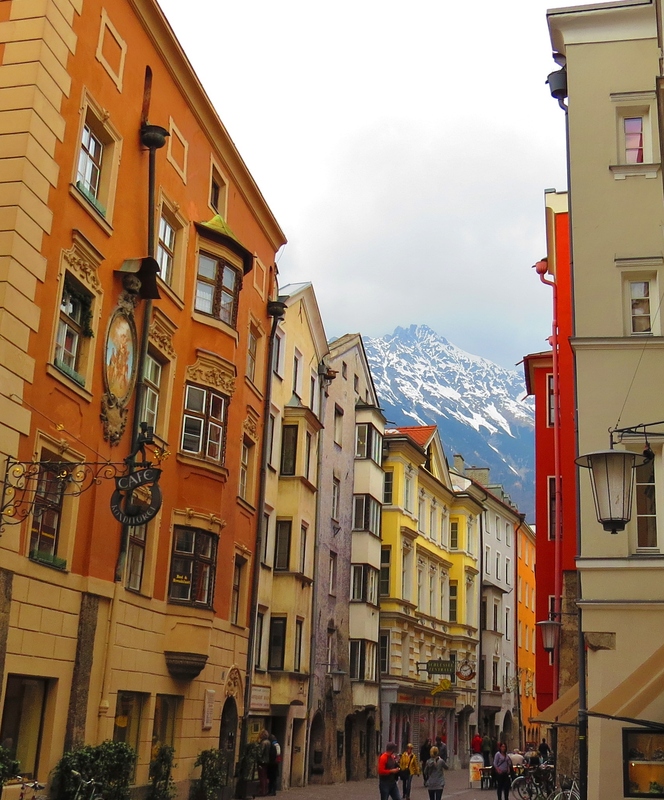 In all directions from the Golden Roof, you’ll find quaint tiny streets, colorful buildings, and shops of all kinds. And no city is complete without street performers – when were there, a man blowing bubbles was the star attraction. You’ll also find restaurants, which is the first thing we did because it was after lunch and we were hungry. Alex was keen to get his hands on an Austrian beer, and I wanted some traditional food. 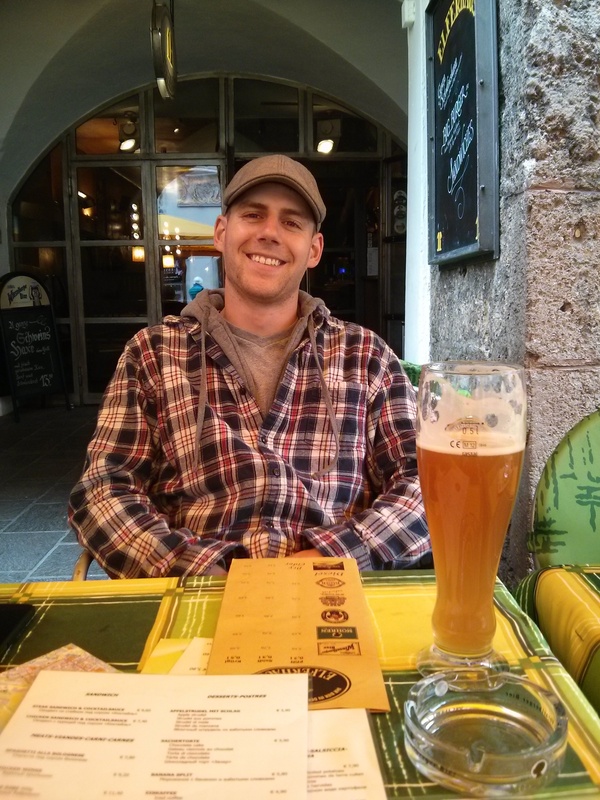 We both got what we want – we each had a half-liter of beer and a plate of meats. 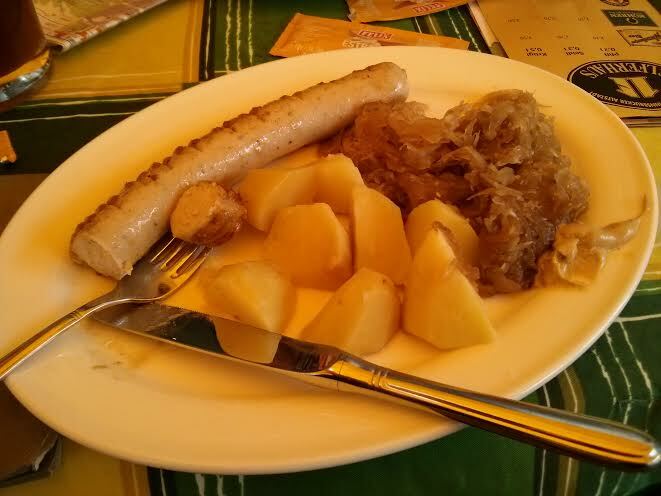 I had my first bratwurst (how I’ve managed to live 26 years without eating a bratwurst, traditional or otherwise, is beyond me), with real sauerkraut and potatoes. Yum. 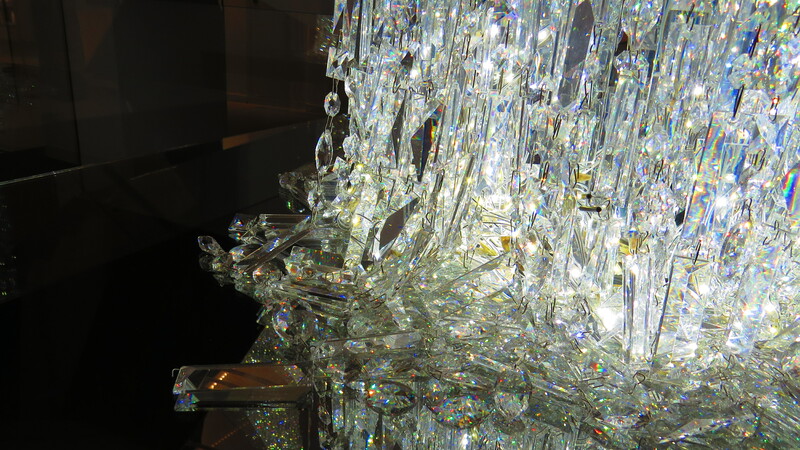 We wandered around a little and decided to pop into the Swarovski store. We had no intention of buying anything, but they have a free public bathroom (tourist tip!) and really, who wants to pay to pee? 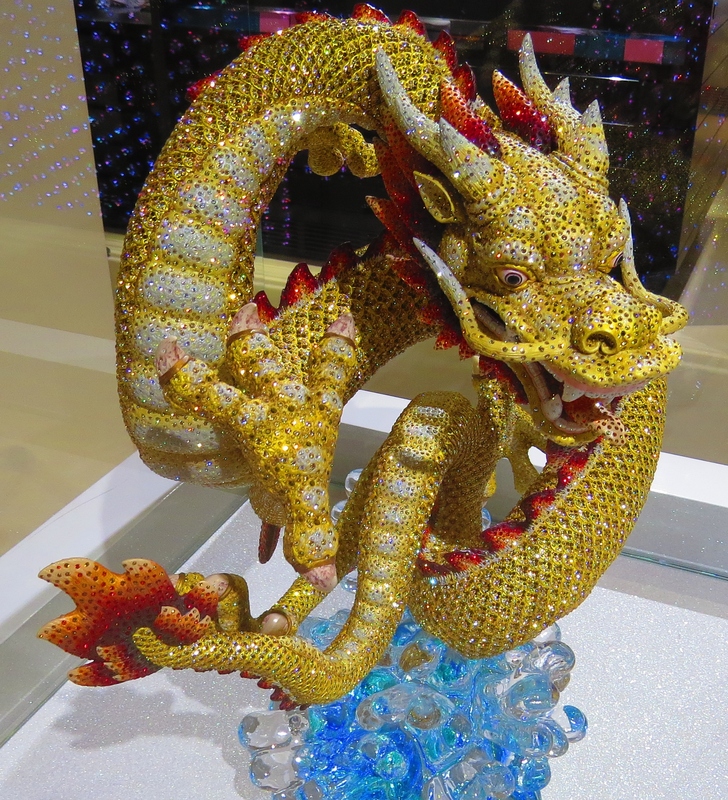 Here’s a pretty sparkly dragon, and the bottom of the chandelier thing they have hanging in the stairwell. Ooooooo, ahhhhh. 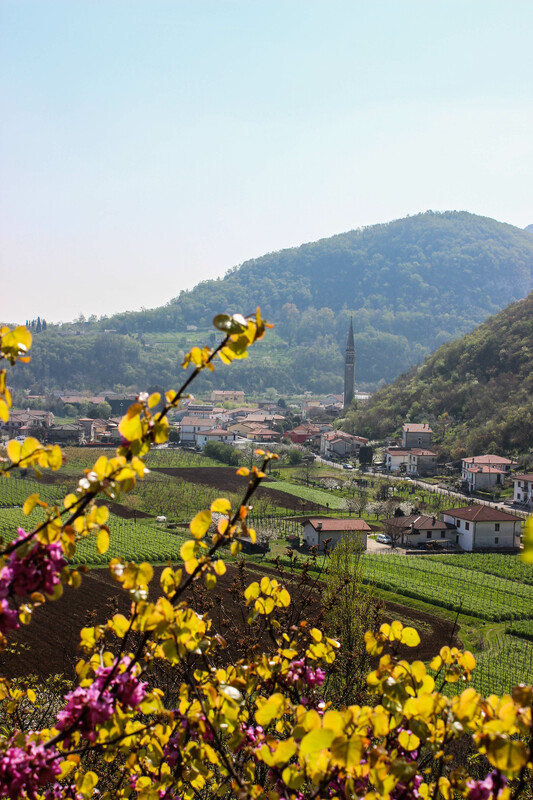 Near the Golden Roof you’ll easily spot an old bell tower. 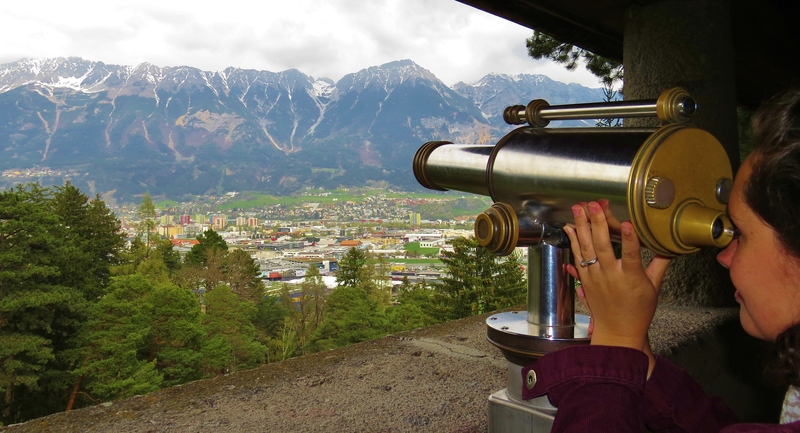 Well, for €3,50 you can climb this tower and see an awesome view of Innsbruck and the surrounding mountains. It’s absolutely worth it, if you’re willing to work for it. There’s no elevator. But you’re in Innsbruck! Go big or go home. 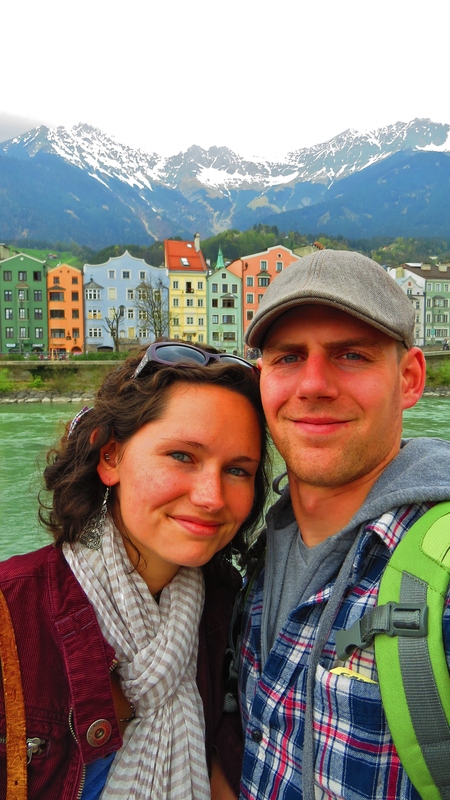 If you walk toward the Inn river, you’re going to find a row of pastel houses with an incredible backdrop of the Alps. This might be my favorite view, even better than from the tower. 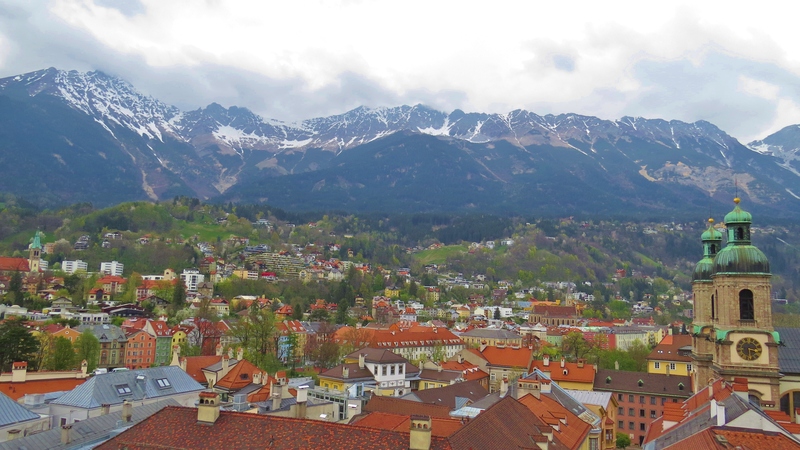 Innsbruck was beautiful, and it could easily fill an entire weekend or much longer if you like to ski. 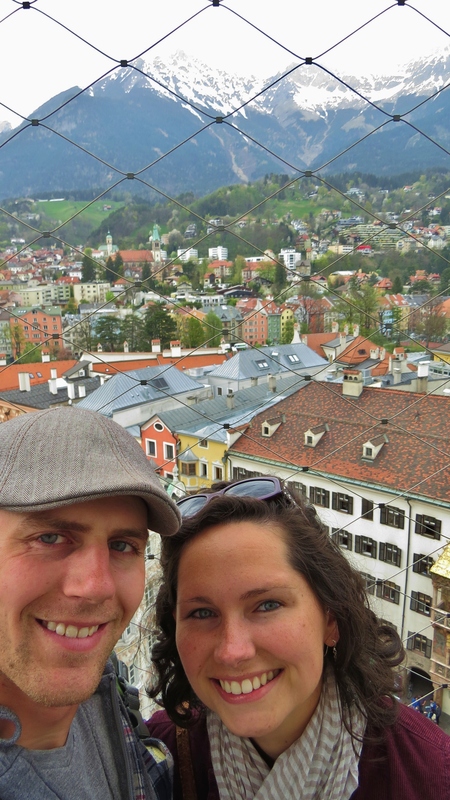 Now we can check Austria off our list, although I’m sure we’ll be back during our time here. Stay tuned for our next trip to Europe’s largest aquarium in Genova! 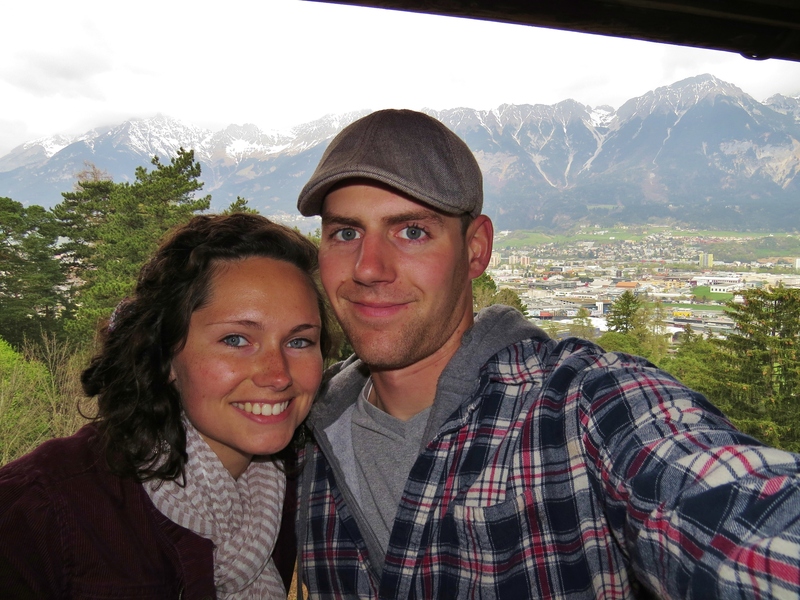 This entry was posted in More in Europe, Travels and tagged alps, Austria, beer, Innsbruck, skiing, travel, vacation. Bookmark the permalink. seems beautiful !! wanna visit 🙂 lucky you ! Thank you, we are very lucky!